I sketched this on a break at school today. The shape of the cactus made of think of something and I just now realized what it was. It looks like a whole bunch of students waving their hands to give the teacher the right answer to a question. I spent longer than expected at the garage waiting for a battery to be changed because the tow truck driver forgot to leave the car keys with the mechanic. That gave me some time to try out some washes on a new Fabriano sketchbook I bought recently. I’ve been using it for drawing mostly but I was pleasantly surprised to see that it takes washes beautifully. Why wouldn’t it? Fabriano has been in the paper-making business since the 13th century. Some days just don’t work out as planned. Like today. It was a bit of a disaster. I wasn’t expecting to spend the day in the Laurentians, rescuing a stranded teenager with a dead car battery. But I grabbed my sketch stuff on the way out the door knowing that there would probably be some time to kill while waiting for the tow truck. 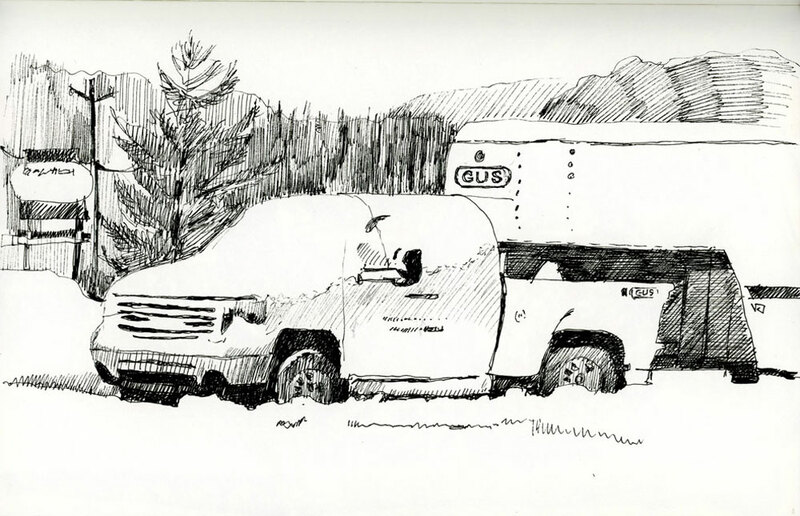 The stranded car in question was parked in Gus’s lot so I got to sketch Gus’s truck. And what is Gus’s line of work? Post-disaster clean-up. How apt. This morning I headed out with the intention of doing some sketching in the Ste. Anne de Bellevue winter market. But when I parked my car facing this little house I changed my mind. Given the choice between indoors and outdoors I will always pick outdoors. That’s probably because what I like best about this process is thinking about colour and there’s always more variety outside. In fact, I realized today that as I am driving around I am constantly mixing colours in my head. The fence along the highway was alizarin crimson mixed with a bit of cobalt blue and this morning’s sky definitely had a hint of aureolin yellow near the horizon. 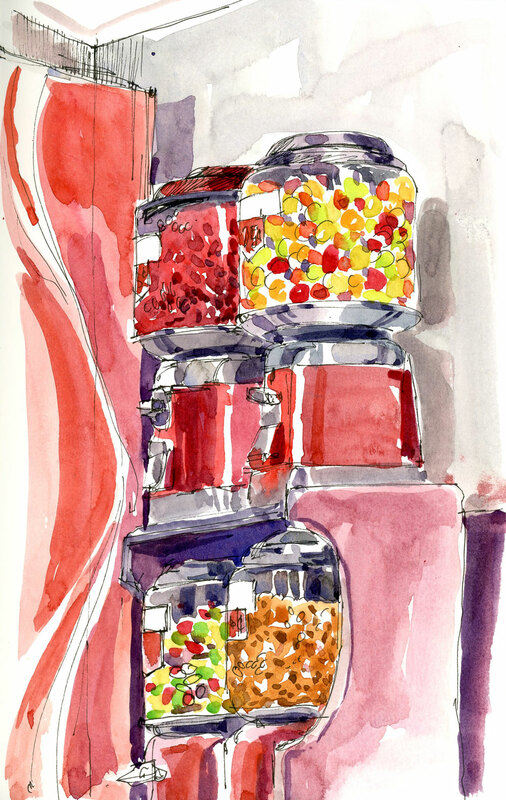 The first sketchbook that I used for this sketch blog project was the smallest watercolour Moleskine, the 3.5″ x 5.5″ one. What I loved about it in the beginning was the very wide or the very tall format that you had by using both the left and the right sides of the spread. Then as I gained confidence I graduated to the bigger Moleskine and I haven’t gone back to the little one for a long time. Until today. The other thing that I love about these books is the quality of the paper. They hold a lot of wash without warping and there is a velvety dryness about the paper that makes it a pleasure to paint on. Not to smooth and not too bumpy. Just right. I wasn’t really chased by nuns but I thought I might be. That’s because this windmill is situated on the grounds of Notre-Dame-du-Vieux-Moulin convent and there are “No Parking” signs everywhere. And “No Trespassing” ones in front of the mill itself. I’ve painted this before from a distance but I really wanted to get close today. I did the drawing outside in the cold because my car was facing the wrong way and I didn’t want to break too many rules at the same time (parking where I shouldn’t be and facing the wrong way). So I stood in the cold and I haven’t done that since November. I kept glancing at the convent to see if the nuns were coming to chase me away but no luck. 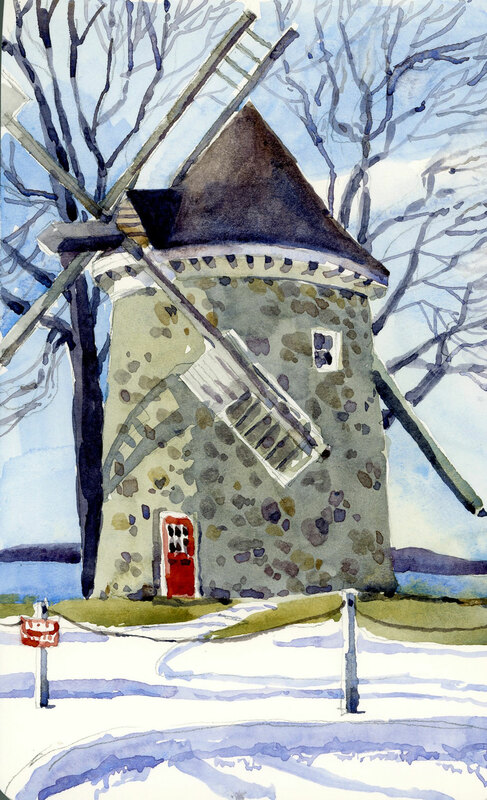 And if you click on the link above to see what the windmill looks like you may notice that I forgot to draw the little window over the red door. I went to school a little early today hoping to put in a little time painting before a meeting. I had it in my head to sketch one of the two cemeteries that are on either side of our building. The parking gods were in my favour because I found a spot facing in the right direction with Montreal in the distance. 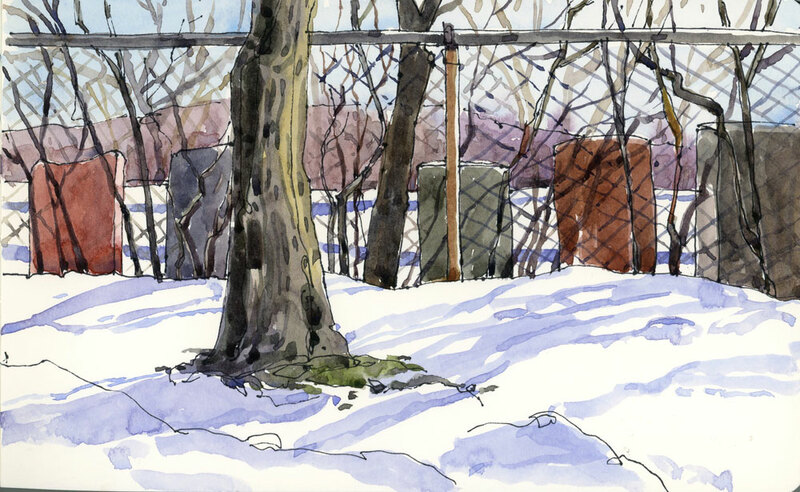 Painting the middle ground was a bit challenging though— the fence, the headstones and a messy tangle of branches growing against the fence.